The annual meeting of the Geological Society of America (GSA) took place from Oct. 22-25 in Seattle, Washington. Students, professors, researchers, and geology enthusiasts came from all over the country, with khakis and scruffy beards in tow, and took over downtown Seattle for four days. Among the 5,000 or so geologists who attended were a dozen of Wesleyan’s own students and professors who came to present research, make connections, and enjoy the city. GSA brings together the country’s geologists to share and exhibit research, drawing people from a myriad of fields under the geological umbrella: petrology, paleontology, geoscience education, and so much more. The many various societies within the world of geology hold banquets and events during the meeting, and universities sponsor alumni events or meet-and-greets. College seniors go to GSA to meet and find potential advisors and graduate school programs, while graduate students go to find jobs at universities. Veterans catch up with friends, or give and receive awards for decades of dedication to the field. GSA is a cocktail of the young and the old, Cretaceous geomorphology and polarizing microscopes, beer and rock hammers, and engaging in (sometimes heated) conversation. Many of the events and presentations this year were held in the large and glassy Washington State Convention Center, and each day of the convention came with a new batch of posters and presentations covering a broad range of geological topics. Grouped into sessions such as “Recent Advances in Hydrogeology,” “Basalt Weathering on Earth and Mars,” and “Mass Extinctions II: Present, Past, and Future,” the research presentations were 15 minutes each and took place in various rooms throughout the center over the course of the day. Geologists milled from room to room, listening to and asking questions about aspects of the lectures that they interesting or controversial. Wesleyan faculty and student were among those who presented research. Undergraduate students in attendance included Eduardo Centeno ’19, Noah Spriggs ’18, Eliza Carter ’18 and Sophia Ptacek ’18. Masters students Melissa McKee and Melissa Luna were also in attendance. Faculty members included Harold T. Stearns Professor of Earth Science Johan C. Varekamp, Professor of Earth and Environmental Science Suzanne O’Connell, George I. Seney Professor of Geology Martha Gilmore, and Associate Professor of Earth and Environmental Sciences Phillip Resor. 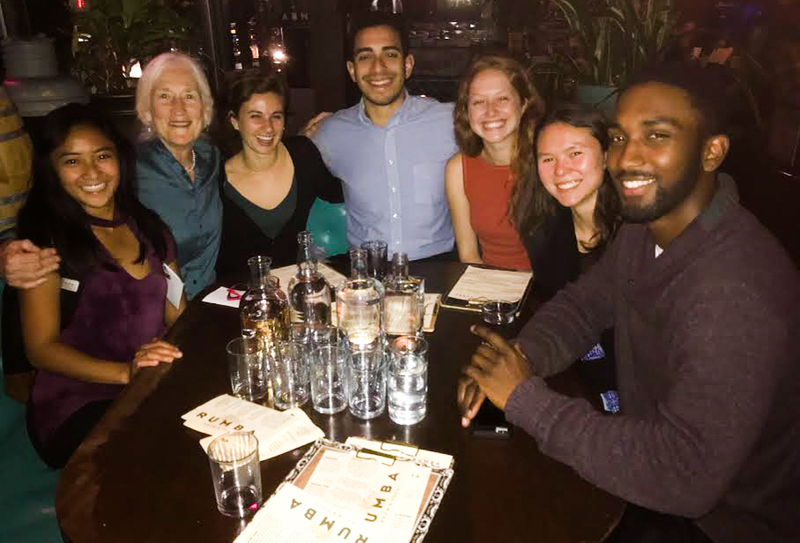 Many of the students at GSA do research with O’Connell; they make up what she dubs her “Antarctica team,” with much of their research centering around geological data from the Weddell Sea in Antartica. Like quite a few other masters students in attendance, Luna presented a poster on some of the work she’s been doing for her master’s thesis. This research focuses on analyzing grain sizes of fine fraction sediment in the Jane Basin, Antarctica. “Basically, grain size is used as a proxy for the speed of the bottom currents of the ocean and information on this can tell you something about how the Earth responded to past climate change,” she explained in an email to The Argus. Centeno, who also attended the conference, has also been working with data from Antarctica. His research focuses on 3 million-year-old diatoms, which are photosynthesizing microalgae. Carter, also a member of the Antarctica Team, presented a poster of some of her work on an age model for core sediments, which interprets the chemical makeup of sediments over the course of various time periods. Carter works with foraminifera, which are tiny shelled organisms that generally dwell in seafloor sediment and have been around for half a billion years. These various projects demonstrate the wide range of geologic research even within the same region of study, hinting at the GSA’s great diversity of science. Luna, Carter, and Centeno all noted that they took advantage of the many talks and presentations that occurred over the course of the conference. Of course, the motivations for going to GSA often differ based on a geologist’s experience, and budding geologists tend to notice that their reasons for attendance change as their career changes. This was certainly the case for Luna. But GSA isn’t just talks and research presentations, or even about finding people to work with, though those are all major aspects. In other ways, GSA is centered around socialization and fun. My mom, who is a paleontologist, has been attending GSA longer than I’ve been alive. As I grew up, every time she returned from her annual journey she came equipped with bags of fun toys and knick-knacks that she’d picked up at a huge fair of booths from dozens of geological organizations and universities. My personal favorite toys were these plastic dinosaur eggs that cracked open to reveal a dinosaur and identification sheet. I went to the fair this year and waited in the crowd of geologists of various ages bouncing on their hiking boots in anticipation of the doors’ opening. When we were allowed to enter, I went searching for those dino eggs for nostalgia’s sake, but alas, I couldn’t find any. I did, however, pick up one bag of rock candy, two field notebooks, two NASA pins, one tape measure and two fidget spinners. A successful haul, if I do say so myself. Though the fun geology-themed toys are a highlight, the main event is, of course, the collection of research presented by the top geologists in the country. An additional wonderful perk is getting a chance to explore Seattle as a city. All of this information, from both myself and University students, may give some indication of how overwhelming GSA was this year. Luckily, we come from an institution willing to help with navigation. Spriggs, who works on Antarctica data concerning biogenic silica produced by organisms like diatoms, explained that University faculty helped him steer through the conference. Centeno also commented that GSA made him appreciate the value of the University’s education. Emmy Hughes can be reached at ebhughes@wesleyan.edu and on Twitter as @emmyughes. It’s good that these students were able to attend GSA in Seattle,WA. A pity the number of Wesleyan attendees was so small, Meetings like this are an important gateway from the classroom to professionalism and to developing a broader view of the profession and the field.